This year marks the 70th anniversary of the discovery of Pluto (not Mickey's dog). 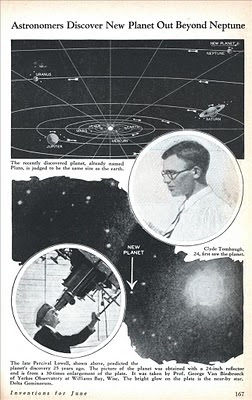 The Modern Mechanix blog recently posted an original article about the discovery of the "planet" Pluto. Just goes to show how times change. In 2006, astronomers officially reclassified Pluto as a "dwarf planet," stripping it of all its full planet benefits. So far, there has been no word on whether animators will reclassify Mickey's dog as a "toy."